annual-$1000 for a year 12 student intending to enrol in a university STEM course. annual-$1000 for a student enrolled at the University of New England in Social Work. Club annual winner-$500; encouraging young women to enter public affairs and policy-making fields. Club annual winner-$500 recognising an Indigenous year 12 student. Supporting the work of O’Connor Catholic College Z Club and Armidale Secondary College Z Club, encouraging and providing opportunities for improving leadership and advocacy skills. Zonta Birthing Kit Project in conjunction with local Z Clubs, and ASPIRE. We support the health and wellbeing of women as called for in the local community, such as by supplying homeware kits to women leaving the refuge for more permanent accommodation, making and distributing breast care cushions for women after surgery, providing Christmas gifts to local women in need, and supplying toiletry bags to the hospital and local charity shops. Attend a meeting or event or visit our Facebook page. This is a good way to find out more about Zonta (locally and internationally). Email us your name and email address to be added to the club’s meeting and event invitation email lists. Prospective members are encouraged to attend at least two meetings/other events before submitting an application to join. You don’t need to be a member of a Zonta club to contribute to Zonta’s efforts to improve the lives of women and girls. 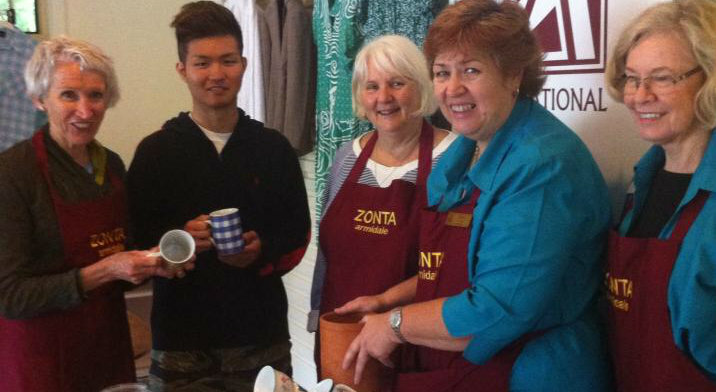 Service projects always need money – your donation to Zonta’s work in general or to a specified local or internal project is welcomed. Consider buying a ticket in our Melbourne Cup trifecta or hand-knitted rug raffle.